Why would anyone want to stay? Now that the Christmas season is upon us, please remember that this can be celebrated as a secular mid-winter festival; after all, the Winter Solstice—nothing whatever to do with Jesus—was how it all began. There is no need whatever to feel guilty about this, despite Christian yelling and protest. Aren’t you tired of being harangued that December 25th has to be about Jesus? Now would be a good time to spread the word about what I’m about to say. I’ve put the word “YOU” in the title to make it easy to address to Christian friends and relatives (yes, I’m a provocateur). They are the ones who should feel guilty about clinging to a religion with such abhorrent features. How can I say such a thing? Well, grab a Bible, and let’s take a Yuletide excursion into the New Testament. Penn Jillette has said, “Reading the Bible is the fast track to atheism.” Am I out to convince people that there are no gods? That would be cool, but I’ll be quite satisfied if at least a few readers say, “There’s got to be something better than Christianity!” There are so many Bible texts that should repel decent folks, but right now let’s focus on six standout examples of bad theology. You feel Jesus couldn’t have meant this because it doesn’t conform to the cherished image of Jesus that has been carefully crafted by the church. Sorry, you have to deal with it. Hector Avalos has shown in a 39-page chapter on this verse (in his book The Bad Jesus) that “hate” here means exactly what it seems to mean. There is a way to get Jesus off the hook: maybe he didn’t say this at all; i.e., Luke got it wrong. 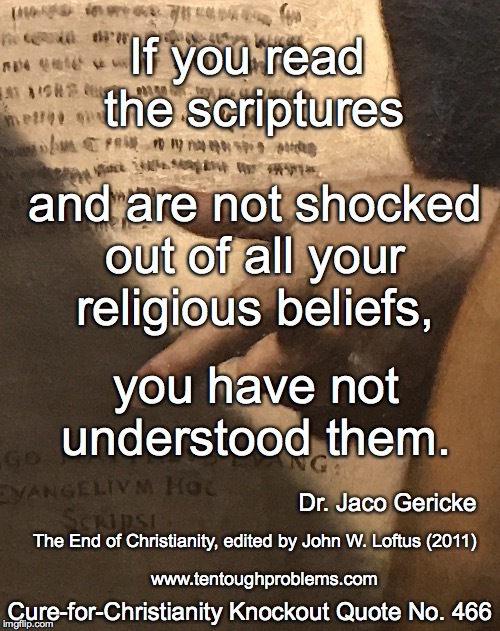 The blunt fact, of course, is that we have no way of knowing what Jesus said because we lack contemporary documentation to verify any of his deeds and teachings. But this is small consolation, obviously—and most Christians don’t want to go there at all. However, they still have to deal with Luke having written this about Jesus; there’s no doubt about that. Luke did it because—and this, Christians, is just part of what you’ve bought into by belonging to the Jesus cult—he wanted followers who would put the cult above loyalty to family. Luke knew exactly what he was doing when he used the word hate. As much as the professional Christian spinmeisters struggle to water down Luke 14:16, it’s right there in the gospel, one of the sayings of their precious Lord. This is Bible Christianity. Still want to stay in the Christian Club? It’s my suspicion that 99 percent of Christians on the planet haven’t read Paul’s First Letter to the Thessalonians lately. Martin Luther urged Christians to memorize Paul’s Letter to the Romans—please don’t do that—but it might be a good idea to put First Thessalonians on your top-ten list, for the simple reason that it is probably the oldest document in the New Testament. So what was on the minds of the earliest Christians? How about the danger of dying before Jesus descended through the clouds to set up his Kingdom? Some folks were worried that their dead relatives—those who had converted to Christ—had died too soon. But Paul had that all worked out, as we can see from vv. 15-17. Their dead relatives will rise, then all the others would join them in the clouds to live with Jesus forever. There will even be musical accompaniment. It seems to me that anyone of sound mind, with the least shred of skepticism, would want to know where in the world Paul got this idea. He was dead wrong about the timing (in many texts he says it’s going to be soon). We can assume that he was dead wrong about the whole idea...here we are 2,000 years later and counting. In fact, of course, Paul tells us that he had visions in which he heard from the risen Christ, so that’s where he got the idea. He hallucinated; he was not of sound mind. Of course, Paul’s followers assumed that his visions were the real thing, thus his assurance was a great comfort. But today? Now he just sounds like another crackpot. This is Bible Christianity, as it was believed at the get-go. Still want to stay in the Christian Club? It is so commonly believed that the coming Kingdom of God, as Jesus so fervently preached it, would be a good thing. Why not, after all? God’s will on earth would finally be done. But when we look closely at the texts, we can see that it will not be a happy event at all—well, for most of humanity. In this text Jesus compares the coming of the Son of Man to the genocide at the time of Noah. Those people long ago had been going about their business, “eating and drinking, marrying and giving in marriage,” but when the flood came they were all swept away. So the advent of the Kingdom means that most people will die. Once when Jesus sent the disciples out to preach, he assured them that the villages that rejected their message would suffer the same fate as Sodom and Gomorrah (Matthew 10:14-15). Yes, of course it is possible to find the “nice” Jesus quotes that end up in sermons and on stained glass windows, but it’s not hard at all to find as well the strident texts in which Jesus sounds very much like a sinister cult fanatic. Did the Galilean peasant preacher himself say these things? Or did the gospel writers, promoters to the Jesus cult, make up the scripts? You can read a thousand books by New Testament scholars arguing the point and still not know for sure. But this is Bible Christianity. Still want to stay in the Christian Club? This reference, of course, is a comparison of Jesus to lambs that were sacrificed at the Jerusalem Temple. So, full stop, Christians: an animal sacrifice was no longer sufficient; God’s revised scheme required a human sacrifice. At the center of Christian theology is a human sacrifice to make God feel better about forgiving us. Why don’t Christians ask, “How can that be?” “Where were their heads, the theologians who came up with this grotesque idea?” They don’t ask because “Jesus dying for our sins” has been made to sound like a grand and noble gesture—reinforced by thousands of paintings, stained glass windows, and hymns. But it’s not grand or noble. Christianity took a giant step backward into primitive-religion savagery. Who is your God, after all? Supposedly we’re talking about an all-powerful God who can’t be outdone in the decency and compassion department. Hence Guy P. Harrison has asked so bluntly: “No one seems to know why a god who makes all the rules and answers to no one couldn’t just pardon us and skip the barbaric crucifixion event entirely.” (Christianity In the Light of Science, ed. John W. Loftus). In John’s version of the Last Supper, Jesus washed the feet of the disciples, but there was no Eucharist. Instead John included this disturbing text earlier in his story. It would be difficult to come up with a more blatant example of magical thinking, e.g., blood becomes a magic potion for getting eternal life, the drum-beat gimmick of John’s gospel. Priests of many religions have been selling this product—which they don’t have—for millennia. What was the lesson here? Total commitment was the expectation, as we saw in Luke 14:26, i.e., any remaining loyalty to family members is ruled out. Clearly the author of Acts 5 wanted to terrorize his readers: unless you give ALL to the cult, Satan has filled your heart, you’re lying to the holy spirit and to God. It’s no wonder that “great fear seized the whole church.” Saint Peter was the fear monger, not such a nice guy on whom Christ would build his church. Obviously the church wasn’t able to get away with this level of greed forever, but we can add Peter to our short list of Christian icons—the other two being Jesus and Paul—who fail to measure up to the standards of common sense and decency. The Greatest of Mysteries about Christianity: How Can Anyone Take It Seriously? How has Christianity managed to succeed? Primarily because magical thinking has enormous appeal: If you believe this, eat that, drink something else, you’ll get eternal life. Also because the church has a stack of feel-good Jesus quotes to push, and has done a bang-up job of making Jesus look good. For most of Christian history, after all, laypeople didn’t even have access to the Bible. But now they do. So why not read the New Testament carefully, meticulously, critically? Inertia counts for a lot of course, and most folks are content with magical thinking because critical thinking holds so little appeal. Many years ago a woman said to me, “I love my religion.” Why jeopardize heaven? The folks in the pews don’t understand the devastating implications of these six texts, which are in charter documents of the Christian faith; they are hardly on a par with obscure verses banning shellfish! Professional apologists, sensing the dangers, naturally try so hard to defuse/defend them. But their religion has been cheapened, poisoned, by these texts. 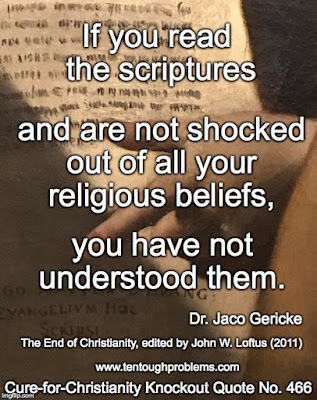 Dr. Jaco Geircke’s warning is valid: “If you read the scriptures and are not shocked out of your religious beliefs, you have not understood them.” (The End of Christianity, ed., John W. Loftus). David Madison was a pastor in the Methodist Church for nine years, and has a PhD in Biblical Studies from Boston University. His book, Ten Tough Problems in Christian Thought and Belief: a Minister-Turned-Atheist Shows Why You Should Ditch the Faith, has recently been reissued by Tellectual Press, with a new Foreword by John Loftus).